Our team at ArcTouch started 2018 the same way we start every year — with an all-hands hackathon. Every year, we get three days of the ultimate freedom for geeks like us — to experiment, build and master the latest technology. This year, we dug into the world of blockchain — exploring all things from cryptocurrencies, decentralized apps, Ethereum, ICOs and even building new blockchains from scratch. Why blockchain? Well, in case you spent 2017 under a rock and somehow missed the Bitcoin bonanza, many are comparing the rise of blockchain technologies to the beginning of the Internet. It has the potential to completely disrupt how transactions are processed, data is stored, software is architected and implemented, and digital histories are recorded and tracked. With cryptocurrencies like Bitcoin occupying the blockchain spotlight, there’s been less media focus on the other more significant applications of the technology. While some consumers have become fixated by the idea of a new kind of currency, there are much broader implications for blockchain technology — and boundless opportunities for businesses to explore it. Blockchain could become the new record of history for the digital universe. Each transaction and action (whether involving money or information flow) is recorded and cannot be changed. As many describe it, this history is “immutable.” Any application that needs an open way to verify the flow of data — or an immutable ledger that cannot be changed without agreement from a majority of the users of that ledger — could be a killer app for blockchain. An example: One of our hackathon teams built a proof-of-concept blockchain solution targeted at aircraft maintenance. As planes and their specific parts are serviced, a record of that work would be stored on the blockchain, date-stamped and digitally signed by those responsible for the work. This immutable record could be incredibly valuable as planes are sold — both in commercial and private aviation. And, it could even help prevent catastrophic accidents caused by maintenance process problems. There are a growing number of tools available to help you create your own blockchain, but many that’ll leave your developers scratching their heads because of complexity, lack of documentation or deployment bugs. But by using Microsoft Azure in combination with Ethereum, some of our teams had their own blockchain up and running in less than 20 minutes. The architecture is rather straightforward: Microsoft Azure provides the storage and compute power while Ethereum provides the blockchain and smart contract functionality. 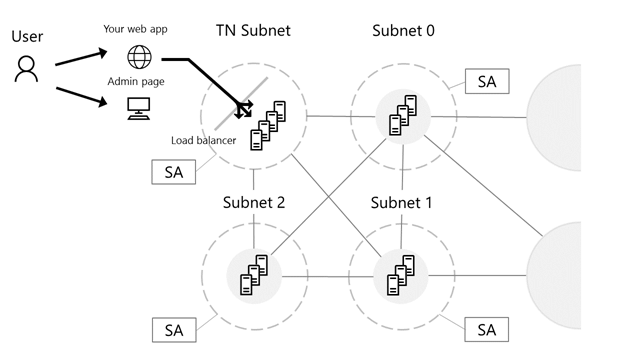 By simply deploying a pre-configured Azure blockchain virtual environment, you will have a main transaction node and three mining nodes ready to go. From there, you can simply launch your genesis block and seed it with some pre-mined ether, the cryptocurrency of the Ethereum blockchain. You now have your very own private blockchain. A couple of our teams also successfully experimented with the Truffle framework within Azure, a nifty toolset that helps make deploying and testing smart contracts on Ethereum blockchains easier. The concept of decentralized computing via blockchain means that data is processed, verified, and recorded everywhere. As you might imagine, this can create some lengthy transaction processing — you initiate a transaction that needs to be verified by the nodes on that network before the block is added to the blockchain. Miners serve an important role in this speed. With more miners (computing systems that perform mathematical functions to verify these transactions) or more high-performance miners, the speed of these transactions can be improved. Remember the old Windows hourglass that would take up your computer screen while you were saving a document or trying to shut down your computer? Well, several of our teams struggled with similar lengthy pauses in their hackathon demos when submitting a transaction to be recorded on their blockchain. Especially in the early days blockchain, as the technology is relatively immature, it’ll be important for developers to create a user experience where the transaction is completed and recorded in the background. For example, if it’s a commerce application and a digital purchase is taking place — take the user to another screen and let them browse other related content (or see other items for sale). Then confirm the transaction when complete with an on-screen notification and/or email. One of the primary strengths of the Ethereum blockchain is its focus on high performance smart contract execution. One such smart contract is a token or altcoin. Ethereum has made it very simple to create your very own token using their “minimal viable token” example code and deploy the token smart contract to the blockchain. In a matter of minutes, you can have your own token and begin sharing with friends — or maybe just hoard them all for yourself. Like any new technology, industry leading companies need to explore blockchain in order to fully understand its capabilities — and limitations. And because it’s a completely new way of writing software, distributing data and creating records of all different types of digital transactions, there’s an entire virtual universe of exploring to do. We had some really strong use cases and technical implementations that came from our hackathon — but we also learned that some of the ideas simply weren’t good fits for blockchain. Just because it can be done with blockchain technology doesn’t mean it should be done on blockchain. In some use cases, a more traditional and centralized application and database architecture is appropriate. Transaction speeds will be far superior, privacy and access controls can be tightly managed, and complexity can be minimized. At the same time, there are absolutely use cases where blockchain should be thoroughly explored. Take for example a supply chain management use case where multiple parties, who may not know, much less trust each other, must all coordinate and collaborate to execute a single transaction for the movement of goods from a supplier to a buyer. A blockchain with smart contracts can remove much of the friction and streamline the entire process with automatic execution as the contract moves from one stage to the next. You can do anything with a smart contract. The power is in the automation of execution and the fact that nearly anything can be programmed into the smart contract. Subsequently, it can be recorded on the blockchain after execution. Smart contracts allow two or more parties which may not trust each other to operate in a trustless state. In other words, they do not have to trust each other, they pass that responsibility to the smart contract and the blockchain to execute on their behalf. Wondering how blockchain can help your business? Chris Reichard - Chris Reichard is EVP of enterprise solutions & blockchain at ArcTouch — and a former rocket scientist, literally. He worked as a space flight engineer at NASA through Lockheed Martin Space Mission Systems.